Today was a very special day, Lola and Ellie got baptized! Tony and I set a very practical goal and that was to get the girls baptized before their first birthday; we did it with two weeks to spare. The girls were very good in the beginning, they seemed to like all the attention. They lasted through the baptism in their Godfather's arms but quickly ended up in mine -two crying babies amplified with echos isn't soft on the ears. We celebrated with a beautiful lunch, Thanks Robin! The girls got their first taste of cake today, Yummy! Time for Sweet Melissa Sundays! 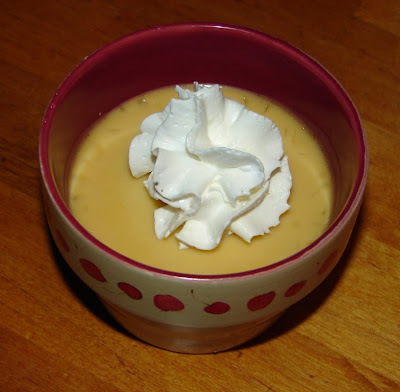 Today's dessert is Butterscotch Pudding, picked for us to try from The Sweet Melissa Baking Book by Jennifer of Maple n' Cornbread, thank you Jennifer! 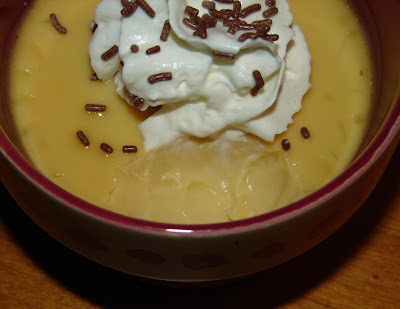 You can find the recipe for this pudding here at Jennifer's site. While I am a huge butterscotch fan, I'm not really into puddings, especially puddings with egg. 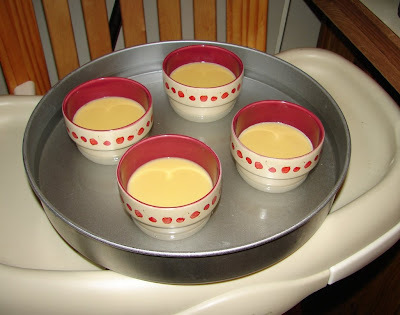 The only time I've made puddings at home were for Tuesdays with Dorie, we are not big pudding eaters here. 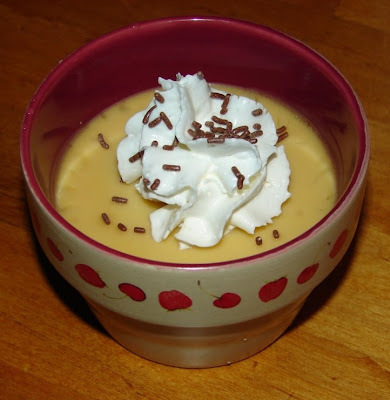 But I just had to give this a try and see how it compared to the butterscotch pudding we made for TWD in December 2008. I ended up liking that one and Melissa's pudding had a very different ingredient list which made me curious. The kids and I absolutely loved this pudding, picky husband hasn't tried it yet. ETA -- picky husband reluctantly tried one tiny bite, then requested the remainder of the ramekin, so that means it was a hit with the whole family :) It had an amazing butterscotch flavor and I enjoyed caramelizing the sugar, that is always a fun process to watch. I tasted the caramel cream before adding it to the egg yolks and it was too salty for me. I would decrease the salt from 1 teaspoon to 1/4 teaspoon for a full recipe. I made a half recipe and used 1/2 tsp salt and think 1/8 would have been plently -- the salt did mellow down a little after baking, but I would still add less than called for next time. The perfect butterscotch flavor surprised me since there is no butter or scotch in this recipe. I baked my ramekins, covered with foil and in their water bath, for 65 minutes -- at 60 they still looked too jiggly. I did notice the top of the puddings (above where the water bath was) were more set than the bottom, almost giving a two layer effect. But both layers were delicious and I really did not taste an eggy note at all in these, they were so creamy and smooth, really perfect texture. I can't wait to make this again and maybe make it into a pie or tart, I'm so glad I didn't let my non-pudding-liking tendencies get the best of me and skip this one or I really would have missed out. Grandma Mar and Poppi are down for a visit and they got the girls these super cute chairs. Ellie was already reading in hers and Lola was jumping around and cuddling in her! 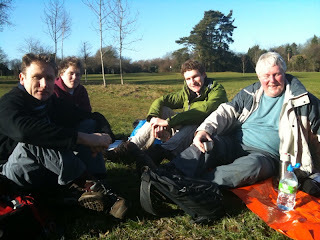 The 3 peaks challengers having their lunch opposite the golf course. Our day of map reading skills and team building going well. Not sure it will be so pleasant on the real thing !! "Mom, I don't care if I am wearing a dress...I'm still going to practice my toe touches!" Lola is getting good at stealing dad's remote! Lola and Ellie were playing together so well today! Look at them playing in their stroller, can you imagine this shot 16 years from now but instead of a stroller it's a car, ahhhhh! Last year when my mother-in-law returned from Paris, she brought back gifts for all. One of the many things she brought us was a pound of sea salt. Nice! I love sea salt. But what I didn't know at the time is that this is no ordinary sea salt. 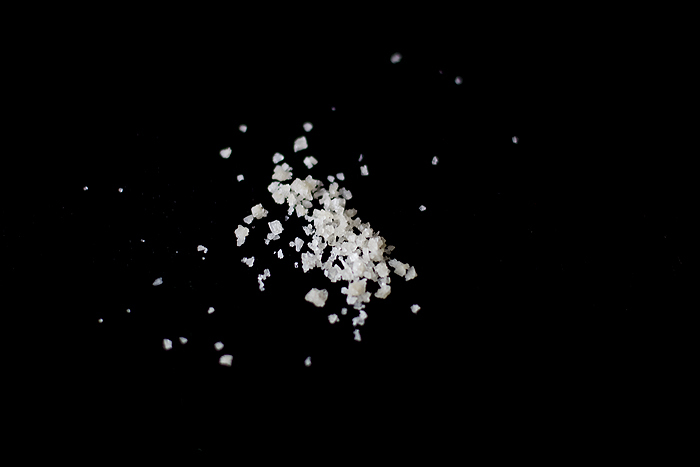 This is Fleur de sel de Guérande. And according to David Lebovitz, "there's no finer salt available anywhere." 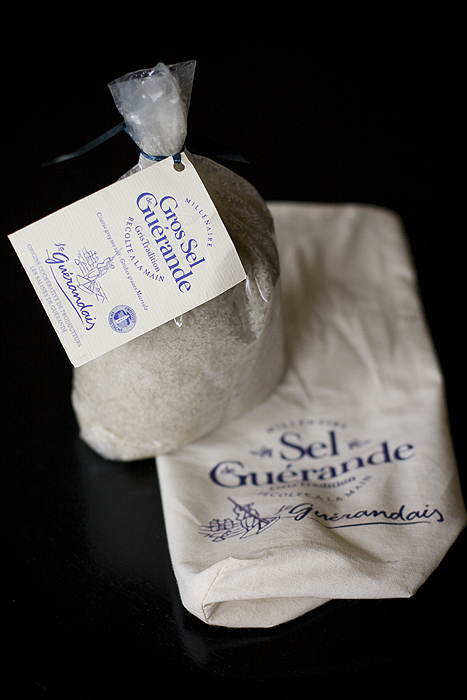 Fleur de sel de Guérande is the most highly-prized of all salts. Salt harvesting in salt marshes of the Guérande began in the year 868, and at that time only women were allowed to rake the fleur de sel. Men were thought to be too rough to do such delicate work. Heat semisweet and bittersweet chocolates and condensed milk in a double boiler over medium low heat until chocolate is melted. Stir frequently. 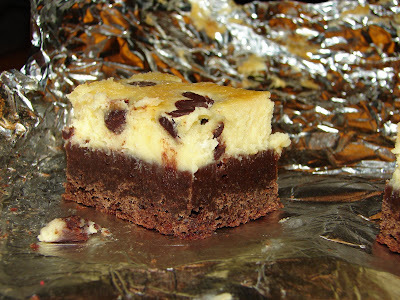 Mixture will have a slight marshmallow texture when chocolate is melted. Stir in 1 Tablespoon of vanilla. Remove from heat and refrigerate for two hours. 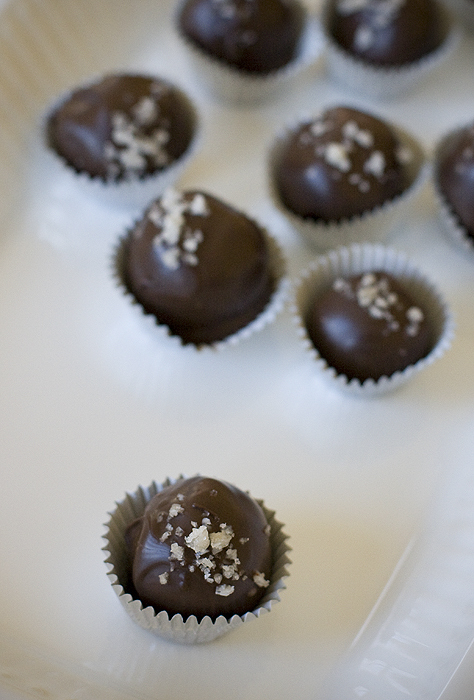 Roll into balls, then roll in melted meltable dark chocolate, coating completely. 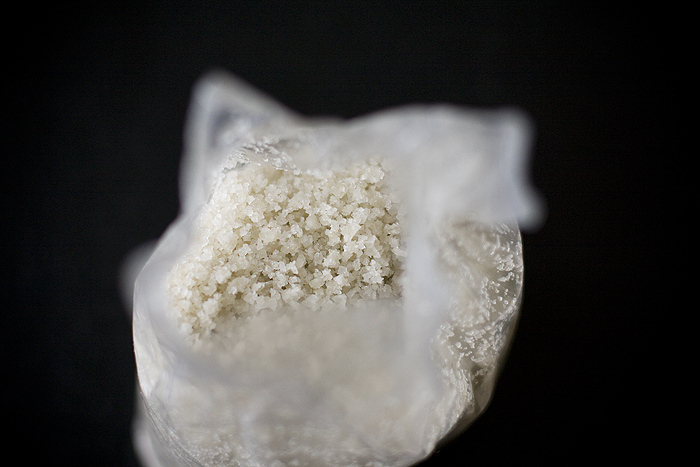 Sprinkle with fleur de sel immediately. Pop one directly into your mouth. Mmmmmmm. 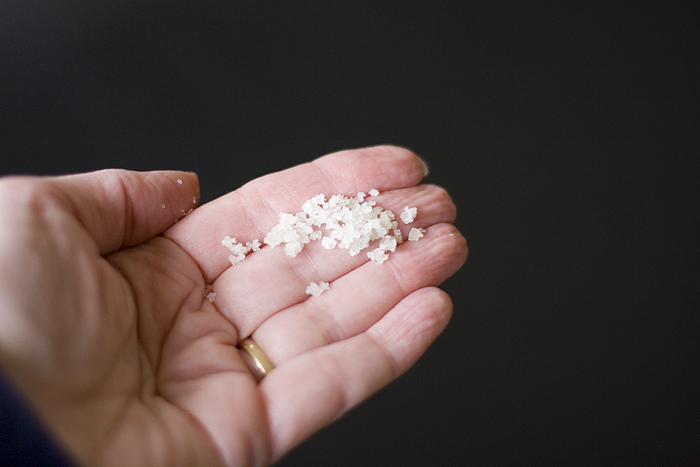 I did find a few different sources for Fleur de sel de Guérande when I did a Google search. Amazon has several choices, and so does ChefShop.com. 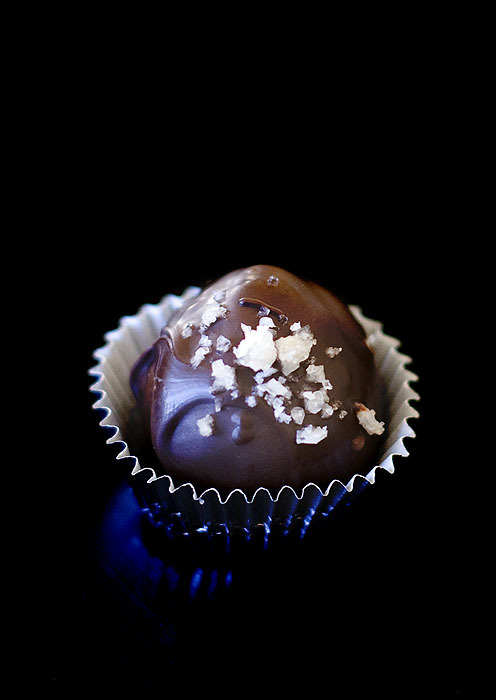 There is something very fine about dark chocolate and sea salt together. 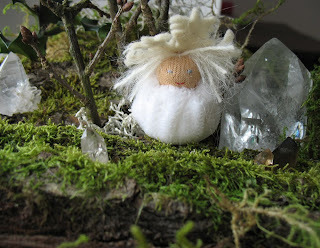 I listed lots of new dollclothing in my Etsy and DaWanda shop the last days. 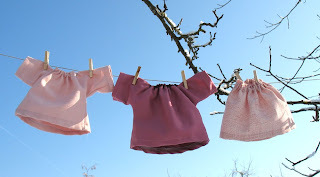 I made new tunicdresses and skirts in all shades of rose and pink. 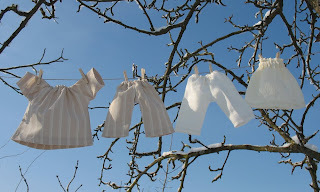 And some natural white tunicdresses, skirts and pants. 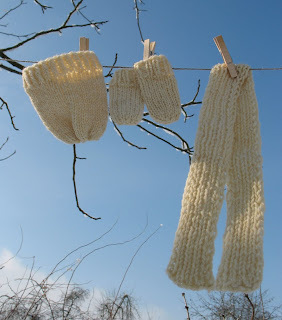 I also listed some handknitt hat, socks and scarf sets. These sets are all handknitt from organic lanbswool by my grandma who is a exceptionally gifted knitter. Tuesdays with Dorie, oh how I've missed thee! 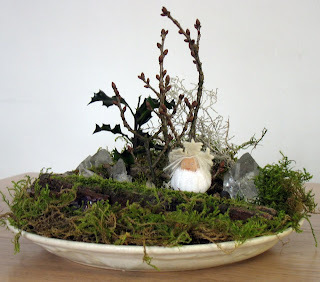 So nice to be back to making (and posting about) our Tuesday treat of the week. These delicious little cocoa-nana loaves were picked for us to try by Steph of Obsessed with Baking, thank you Steph! 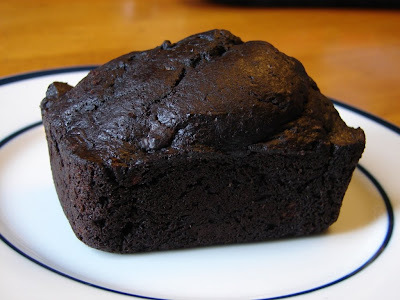 I used up the last of my Hershey's Special Dark Dutch processed cocoa powder for this recipe, the recipe calls for 1 cup of cocoa powder and I used 3/4 cups of Special Dark (finishing up my box) and 1/4 cup of regular Hershey's cocoa powder. 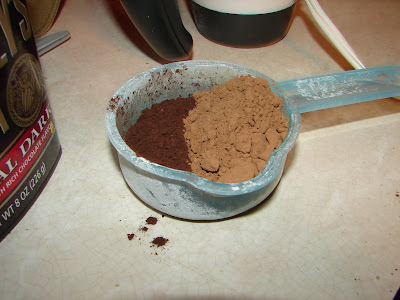 If you love dark chocolate you really need to have some dark cocoa powder in your pantry because this Special Dark cocoa powder really packs a dark chocolate punch. 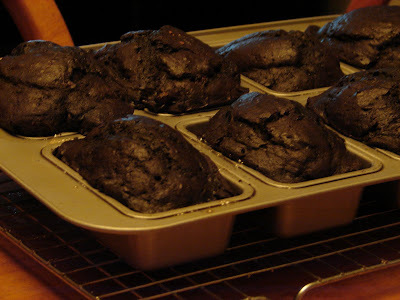 The Special Dark cocoa powder gave these breads an outrageously dark look but also a real chocolate depth to go with the banana. The little loaves were delicious and to me the flavor improved after sitting overnight. Do these look familiar? 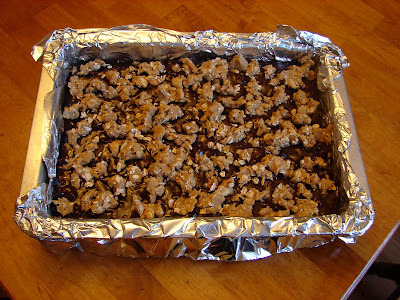 They were last Tuesday's treat, Lillian of Confectiona’s Realm picked Chocolate Oatmeal Almost-Candy Bars to try and I baked along with everyone and really loved these bars (raisins and all!) but didn't get a chance to post. These were such a yummy treat and as much as I enjoyed them I did have a couple of taste testers who were turned off by the raisins and picky husband said that the chocolate part was good and the oatmeal base was good, but together they were just too much...he couldn't even finish one little bar, silly guy! The girls had a great Saturday yesterday! It was the first sunny and dry day in a while. This is how Ellie rode all the way through Target. Tony was in heaven. Ellie absolutely loves riding on her daddy feet. She screams when we try to take her off and she hold on so tight that we don't worry about her falling. Needless to say they got a ton of attention! No pictures of the park, but the girls has a blast and I am sure it felt good to play outside, since they had been cooped up all week. Uncle Mark stopped by for a visit! Ellie being the dare devil again and Lola just loving her tickles! I'm so happy to be posting again! Today's treat for Sweet Melissa Sundays is a giant pan of Black Bottom Brownies, picked for us to try by Cynthia of Bakingtherapist’s Blog, thank you Cynthia! The pan isn't really that giant, just a 9 by 13, but anytime I make brownies or bars in anything bigger than a 8 by 8 pan it seems like a giant batch to me. 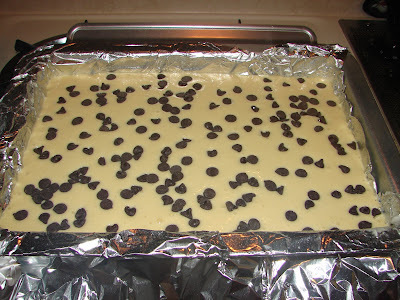 Here are the brownies before going into the oven, notice that there aren't quite 2 cups of chocolate chips sprinkled over the top as called for in the recipe. I had measured out 2 cups and after sprinkling only about 1/2 cup I decided that would be plenty of chocolate chips on top. 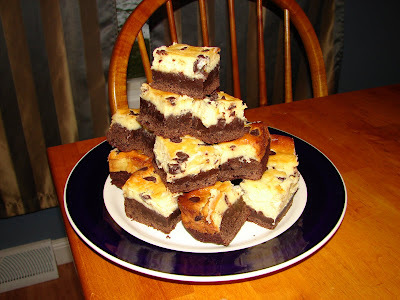 When I got started baking these I knew I would need quite a few eggs since the brownie layer and cheesecake layer both have eggs in them but I neglected to count out my eggs and only had 9 left when the recipe calls for 10 eggs and 2 yolks. Yikes, that's a lot of eggs! So I skipped the two yolks that were called for in the brownie layer (4 eggs plus 2 yolks were what the recipe requested) and in the cheesecake layer I used only 5 eggs instead of the 6 called for. I don't think these brownies suffered any adverse effects because I was short 3 eggs. One other change I made was to bake these at 350 instead of the 325 called for because I was using an insulated 9 by 13 pan and that bakes best at 350. Total baking time was around 50 minutes. The kids really enjoyed these a little warm, after the cooling off period but before refrigeration overnight. I personally liked the better from the fridge. Husband was a no try because he hates cheesecake. They are very rich so be sure to cut them small if you give these a try. 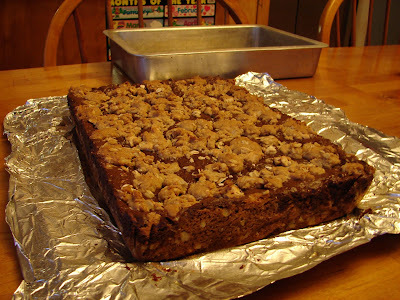 The recipe can be found in the Sweet Melissa Baking Book and I think it will also be posted at Cynthia's blog. To go along with our learning of winter we went to the gym or our "frozen pond" to ice skate. The children had a great time skating around and pretending to be famous ice skaters.